If you experience a severe toothache or discomfort, you may have an infected tooth, known as a dental abscess. A dental abscess in no laughing matter and requires immediate treatment. An abscess is an infection that occurs at the root of a tooth or in between the gum and the tooth. In addition to being quite painful, the risk for potentially serious complications can develop if you leave the tooth untreated. Dr. Jeff Nichols offers treatment for tooth pain in Cocoa to stop the infection while restoring the health and function of an infected tooth. The most common cause of an abscessed tooth is due to severe tooth decay. When an opening in the tooth enamel has occurred, bacteria enters the tooth, causing the pulp to become infected. This infection can then spread to the root of the tooth and the supporting bone structures. In addition, the bacteria can also enter the bloodstream, causing potentially dangerous results. The longer you leave an abscessed tooth untreated, the more severe the long-term consequences will become. 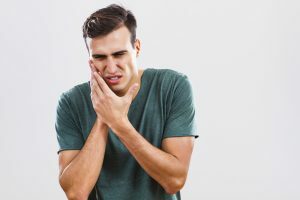 An abscessed tooth can cause a wide range of symptoms; however, the most notable symptoms involve pain, swelling and tooth sensitivity. It is not uncommon to develop a fever, have bad breath, or even a poor taste in the mouth. The abscess may even drain into the mouth through a sore that develops. If you are experiencing tooth pain in Cocoa, you need to schedule an appointment with Dr. Jeff Nichols. Dr. Nichols will perform an evaluation to determine the cause of the pain. If your tooth is abscessed, he will quickly treat the infected tooth using same-day dentistry. In just one day, your tooth will be treated and you will have your custom restoration to restore the integrity of the tooth. An abscessed tooth will require a root canal to remove the infection and damaged areas of the tooth. Your tooth will then be cleaned and sterilized prior to being sealed with a special material. We will then take scans of your mouth to create a custom-made crown. We will place the crown over the tooth to restore the tooth’s health and function. Your restoration will match your exact specifications for a repair that blends in seamlessly with your remaining natural teeth. In just one day, you will have your infected tooth treated and walk out with a new, healthy smile. Dr. Nichols strives to provide his patients with the latest dental advancements to simplify dental care without compromising results. Dr. Nichols knows that time is valuable, which is why he offers a variety of same-day services. In addition to treating dental abscesses, he also provides same-day care for tooth pain, knocked out teeth, and children’s emergency dental care. If you are experiencing tooth pain, do not wait for your next appointment. Time is of the utmost importance to promote the outcome of the situation. Do not wait for more complications to develop. Treat your abscessed tooth today.